On Vignetting the Compost, Stephen Wilkinson pulls a rabbit out of his hat and shows that he's done what everyone wanted him to do but that nobody believed he could: he's grown -- as a songwriter, as a musician, and as a producer. In most cases, I've found the peripheral information and circumstances surrounding the creation of an album to be interesting but inconsequential. Sure, it helps to know that Set Fire to Flames' Sings Reign Rebuilder was made by 13 people locked in a house for a week without sleep or sunshine, but it doesn't matter to me that SND's Stdiosnd Types came from machines in a Sheffield recording studio. When it flows through the earbuds, I'm immediately on a pixilated tropical island (picture Super Mario 2 without the baddies), kicking back and admiring the flora. Bibio's Stephen Wilkinson is British and used the fishing trips in Wales his father once took him on as his wellspring of inspiration. And while I can see the connection when I try hard enough, for my money Bibio's music is the perfect evocation of being in the middle of the American nowhere in an altered state -- or, more innocently, the memories of growing up in the heartland as they arise hazily in the mind of an adult. (There's a reason why Bibio was recommended to Mush Records by Marcus Eoin Sandison, one-half of musical drug/nostalgia-dealers Boards of Canada.) Some call it folk, which often connotes communality; I hear it more as a close cousin of country, in that it's meant to be experienced alone, preferably during a summer drive through a town with a population under 1000 and a sign that reads: Life moves a little slower here. Bibio is mostly just Wilkinson, his guitar, and any number of unnamable pieces of processing paraphernalia. The M.O., which has remained quite consistent through his two proper albums and a handful of remixes, is to noodle around on the guitar a little, record it, and then treat the recordings in a variety of ways as the mood strikes him. (The treatments don't sound as if they come from a laptop, but rather from tape players and ancient analog equipment, lending the music a weathered age effect and a nice organic touch that sets it apart.) Because the instrumental ingredients and song structures didn't change very much from track to track on previous releases (either he would opt for ambience or, more likely, loop the same phrases over and over), the music lived and died on the basis of texture. Fi, his 2004 debut, succeeded on these grounds: Wilkinson cloaked his compositions in a ragged yet woozily pearly atmosphere, as if to shoot them through the eyes of someone waking up to the daylight blooming over the Midwest, and in this case, the reasons why the record was slight were the same ones that made it so perpetually listenable. When he switched up his textures from dreamy and glassy to parched and stringy for 2006's appropriately titled Hand Cranked, he came up short. The songs (or loops) were still in place, but as the sound got too literal the nostalgia evaporated, and Bibio's approach suddenly seemed stagnant and pedestrian. On Vignetting the Compost, Wilkinson pulls a rabbit out of his hat and shows that he's done what everyone wanted him to do but that nobody believed he could: he's grown--as a songwriter, as a musician, and as a producer. Songs have become songs as such, and even the amorphous moments are prettier and more confident than they have been in the past. He's also latched onto a set of textures that find a place for those of Fi and Hand Cranked to more or less meet in the middle, which, wouldn't ya know it, strikes a sublime balance. You can hear it right away, on the album's opener and single best track, "Flesh Rots, Pip Sown", where three twangy guitars, an old honky-tonk piano, bird chirps and a heavily treated recorder weave through each other like threads in a soft woolen blanket. It feels like the most beautifully complete piece of the entire Bibio mosaic, especially when Wilkinson's own voice comes through all warbly at the end, singing a painfully short verse on which he sounds quite close to Benoît Pioulard. Even when the sound leans toward the dry Hand Cranked variety, he's made it work for him by pairing it with songs that call for it, most notably on the Woody Guthrie folk of "Mr. & Mrs. Compost" (featuring an unusually clear Wilkinson on the mic). It's comforting to hear a bit of old glory Fi ethereality too, as on the ambient closer "The Garden Shelter", whose delicate eddies conjure up the image of -- to borrow a song title from Chihei Hatakeyama, who may have been an influence -- a swaying curtain in the window. Wilkinson has also grown as a compiler of his music, and I'm sensing that he is paying close attention to how he can create an atmosphere through album flow. To take a mid-record chunk as an exemplar, the three tracks "Under the Pier", "Weekend Wildfire" and "The Clothesline and the Silver Birch" are actually more like eight, since each is split into at least two sections. First comes a warped merry-go-round guitar figure drenched in faded blues and yellows, then 30 seconds of resigned country/post-rock noodling, then a consciously campy hayride of a melody, then -- whoosh! -- a flurry of strumming like a Sung Tongs-era Animal Collective ransacking the hay wagon, then a puddle of guitars and drones deliquescing into the grassy ground, then a small slice of Tortoise-themed future rock, then the sounds of children blowing onto the tops of soda bottles, and finally, a chorus of plucked guitars ricocheting against each other like wind chimes in the breeze. Through this saltatory sequencing, Bibio demonstrates a kittenish playfulness with his own material that didn't used to be there, and brings us on a dreamlike adventure without relying on fey and dreamy surfaces to do all of the heavy lifting. Disregarding what the ups, downs and roundabouts in the sequence mean on deeper level, the sheer variety of tracks showcased to heightened effect on Vignetting the Compost ensures that there's something for everyone. Folk tributes? Check. Barnburners? Check. Gorgeous cloud-drift ambience? Check. In all cases, Bibio's appreciation for youth, the natural world and small-town living is apparent, which means Bibio sounds like Bibio for the third time in a row -- and that's great news for those of us (ahem) who weren't quite ready for him to drop everything and take off somewhere else entirely. There are a handful of moments that fall flat or otherwise don't work; "Great Are the Piths", which boasts far and away the album's cleanest production, has the feel of 1970s soft rock quicksand, and "Odd Paws" is so shriveled and comical it sounds as though it were played by a family of muskrats on a floating log. But I like the idea that Wilkinson is experimenting, testing the waters and, I would imagine, making a note of which efforts pay off and which ones do not. What's more, it suggests that Wilkinson has a few more tricks up his sleeve and a catalogue-conquering album still left in him. 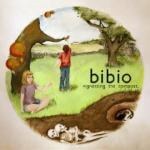 Though Vignetting the Compost misses perfection and lacks the easy narcotic bliss of Fi, it's Bibio's best record.